If you haven’t heard by now, Cluster Dextrin® (highly branched cyclic dextrin) isa favorite among many experienced supplement users and for good reason. It supplies great steady-state energy, replenishes glycogen without spiking insulin levels, and clears the stomach faster than many other performance carbohydrate sources. Also, what’s helping it gain popularity in elite trainer and athlete communities is the continuing body of positive research that is continually growing. A new study from Japan put highly branched cyclic dextrin (HBCD) to the test in a time to exhaustion clinical trial. Elite swimmers were asked to swim for 5 minutes at 75% VO2max and then rest for 3 minutes. After 10 cycles, the subjects swam at 90% VO2max until exhaustion. All of this was done immediately after drinking half a liter of a glucose drink, a HBCD drink, or a water based placebo. The results were staggering and showed that it took those using HBCD 75% longer to become exhausted when swimming at 90% VO2max. How is this possible? Research has shown that gastric emptying greatly slows above 75% VO2max during physical activity. Research has also demonstrated that insulin spiking associated with glucose intake can inhibit performance as well due to an imbalance in blood glucose levels and insulin levels. These two factors give HBCD a clear advantage over glucose in this performance test because it rapidly clears the stomach even at the 75% VO2max. Also, HBCD does not spike insulin but does have the ability to increase blood glucose levels to supply working muscle energy in a more efficient manner than the other carbohydrate used in the study. Researchers used elite swimmers for this type of research because of their susceptibility to cramping. Have you ever been told to wait at least an hour after eating something to go swimming? That’s why. In any case, rapid gastric emptying rates are of great importance to any athlete because whether it’s before or during training, carbs help performance, but not if they cause cramping. This is one of the many reasons why HBCD is becoming popular among elite trainers and athletes. As with any supplement protocol, you should experiment to see what works best for you. However, one of the advantages of Cluster Dextrin is that because it clears your stomach faster than other carbohydrate sources, you can ingest it closer to or right before physical training. For general athletic performance, it is generally recommend to have 1-2 grams per kilogram of bodyweight before training (1-2g/kg) of carbohydrates before training 3-4 hours before training. In this particular study, 1.5g/kg was used immediately before training. For weightlifters or advanced athletes looking to increase anabolic response or protein synthesis rates, adding essential amino acids (8-10g) or protein (20-25g) to your HBCD before or during training will suffice. For endurance athletes performing longer duration exercise it is generally recommended an additional 30-60 grams of carbohydrates be used per hour. Kerksick C, Harvey T, Stout J, Campbell B, Wilborn C, Kreider R, Kalman D, Ziegenfuss T, Lopez H, Landis J, Ivy JL, Antonio J. International Society of Sports Nutrition position stand: nutrient timing. J Int Soc Sports Nutr. 2008 Oct 3;5:17. Shiraki T, Kometani T, Yoshitani3 K, Takata3 H, Nomura T. Evaluation of Exercise Performance with the Intake of Highly Branched Cyclic Dextrin in Athletes. Food Science and Technology Research, 2015 21 (3), 499-502. 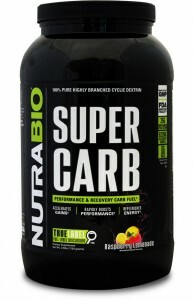 This entry was posted in Knowledge Bombs and tagged carb, carbohydrates, cluster dextrin, hbcd, knowledge bomb, super carb by NutraBio Labs. Bookmark the permalink.